On January 15th Delhi wrapped up a drastic two-week experiment to reduce car emissions by restricting road use to odd- or even-numbered licence plates on alternate days (a method occasionally used in Beijing, São Paulo and a dozen other cities). When the local government announced the scheme in December, many predicted failure. Proud car-owners would ignore it. Police would be too few or too corrupt to enforce compliance. 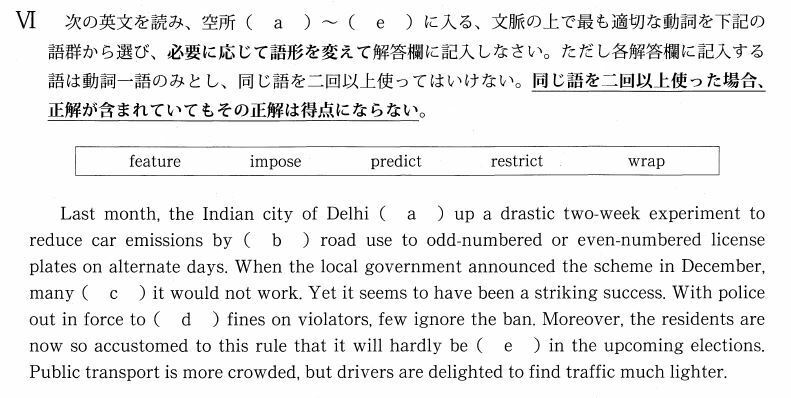 And anyway, in a city with 2.9m cars but some 7m motorbikes and motorised rickshaws, and with many exempt from the ban such as taxis and other public vehicles, the effects would be minimal. Yet it seems to have been a striking success. With teams of volunteers manning corners to shame would-be shirkers into parking their cars, and police out in force to slap on fines, few flouted the ban. Nor can anyone now claim to be unaware of a problem to which residents had become so inured that it has hardly featured in elections to date. Public transport was more crowded, but passengers were delighted to find traffic markedly lighter. Moreover, the residents are now so accustomed to this rule that it will hardly be ( featured) in the upcoming elections. Nor can anyone now claim to be unaware of a problem to which residents had become so inured that it has hardly featured in elections to date.